Destroyit 3804CC is a great choice as an office/departmental shredder. 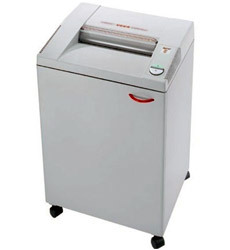 Destroyit 3804CC Cross Cut Paper Shredder comes with a Safety Protection System package (SPS) which is controlled electronically. A transparent safety flap has been included as a safety element in the feed opening. The operational status of 3804CC shredder is indicated with back-lit symbols and varying colors by an intelligent control element. Auto-reverse functionality is also present for situations when the paper gets jammed. If the shred bin gets full, the shredder stops automatically. Destroyit 3804CC has a single phase motor which runs continuously and is quite powerful. It also has a wooden cabinet of high quality and a gear box housing which is dust proof. This model is a replacement for the Destroyit 3803CC. Cut Size 3/16" x 1 1/2" or 3/32" x 5/8"